Summary: No one is entirely certain what brings the Emperor Sikander to Shalingar. Until now, the idyllic kingdom has been immune to his many violent conquests. To keep the visit friendly, Princess Amrita has offered herself as his bride, sacrificing everything—family, her childhood love, and her freedom—to save her people. But her offer isn’t enough. 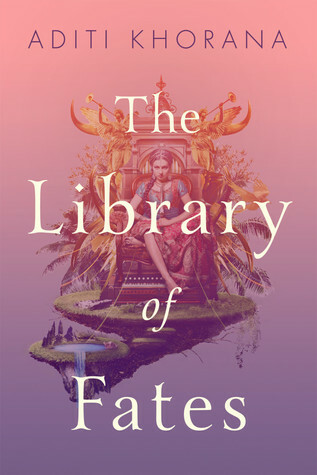 Review:The Library of Fates is a timely book that calls for action on the part of individuals. Amrita is not sure who she is, but in the midst of turmoil she must find out what she is willing to do and what she believes. Mala, the woman who helped raise Amrita, explains that you find out who you are by the choices you make and the actions you take. When we reflect on what we do and how we decide things, we see what is actually important to us. I really love that in this discussion Mala also tells Amrita “Develop some swagger” and “You’re far more powerful than you know.” I think many young people can stand to hear such encouragement. As Khorana mentioned in her author’s note, some issues in our nation right now seem to be much like the things happening in this book. The Emperor Sikander comes from a place where things are wonderful for the wealthy, “but if your poor, or disabled, if you’re a foreigner, or even a woman, Macedon isn’t so kind. This country is built on the backs of the disenfranchised.” The author explains the moral of the story at the beginning of the book. “When we act with only our selfish interests in mind, disregarding the rights and experiences of others, everybody loses. But when we act in the service of the greater good, even if it costs us something–even if it costs us a lot–we are deeply and profoundly transformed by love, empathy, and wisdom.” If things matter to us, we can’t stand by and just watch – we must act and create change. Amrita decides to do something, but definitely struggles as she tries to figure out how best to help her kingdom. There are so many unknowns and that is more than a little terrifying to her. Amrita’s physical and emotional journeys are both intriguing. Amrita has grown up hearing stories of magic, but she has also been taught that as royalty, logic and strategy can save the day. Amrita hasn’t put a lot of faith in magic, but as her world is crumbling and she sees possible evidence of magic, she begins to question her unbelief. The book is filled with magic and reminds me that there is more to our world than what we can see. I tend to believe that if we are still and listen, the world will share its mysteries with us. They may not be quite as fantastic as what Amrita and Thala experience, but there are still plenty of mysteries to discover if we only pay attention. And yes, there are also some romantic relationships within this tale. The relationships do have a physical aspect, but companionship tends to have a high priority. Recommendation: Get it soon especially if you enjoy fantasy with a little romance.